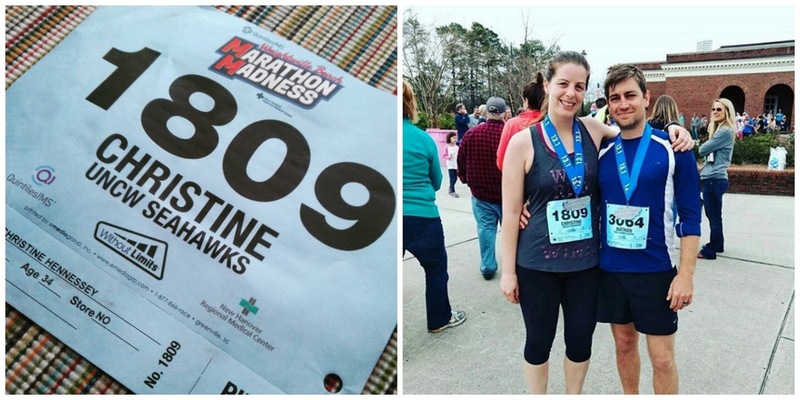 On March 25th, I ran the Wrightsville Beach Half Marathon for the fifth year in a row. I used to race quite a bit, though I've never been that fast. These days I run one race a year, and Wrightsville Beach is it. I love this event for a few reasons: the start line is less than fifteen minutes from my front door, the course is flat and pretty, at least one friend usually shows up to cheer me on (I see you, Kat, Katie, and Dory!) and my marketing agency runs the race's social media accounts, which means I can retweet my own victorious photos. Hey, it's the little things. Every year I say I'm going to train really hard for this race and PR, and every year I am full of excuses. While I didn't break any records during this event, personal or otherwise, I managed to have a pretty good training cycle. For the last three months, I did my best to make running a priority. I actually did speed work, and I made time for long runs on the weekend., which resulted in three 8-milers, one 9-miler, and one 10-miler. I mostly ran alone, as my best running partner moved away last summer and Nathan works weird hours. It had the potential to be lonely, but I didn't mind too much. I like running by myself, and never bring music or podcasts with me. Just silence and my own thoughts, which is a rare treat. There were a few changes with the race itself this year, too. The course had been altered due to some construction, and instead of ending at a large, outdoor mall, the finish line was located on the UNCW campus. This was a huge improvement! UNCW is beautiful and running past buildings I'd once studied in was way more fun than running past a bunch of stores I preferred not to shop in. The new finish line also meant the course covered some new ground, including a part of the Gary Shell Cross-City Trail I'd never been on. The morning of the race was warm. We (I) decided to save money by skipping the shuttle and parking my car at UNCW, then driving Nathan's truck to Wrightsville Beach for the start. This went off without a hitch and we had plenty of time to wait in line for the bathrooms. The bathroom line, however, was really long. In fact, we were still waiting for it when the gun went off! Luckily the race is chip timed, so it didn't matter when we started running. The only downside was that I didn't get to run with the two-hour pace group. Oh, well. Nathan and I stuck together for the first part of the race and we kept a steady pace - right around 9:07, on average. I felt okay but not great. At mile 7, we finally left the Landfall neighborhood, which is a super rich and gated community. Think big McMansions and wealthy people drinking mimosas in their front yards while waving at the runners trudging by. Entering Landfall is always a novelty, but after four miles or so I'm ready to escape. Once we were back in the regular world, Nathan decided it was time to run his own race and was soon out of sight. Without him or the two-hour pace group, I was left to my own devices and started to slow down. By the time I reached mile 10, I was done. I had a huge blister on one of my big toes (like, the biggest one ever - I took photos but I'll spare you). It was much warmer than it had been at the start. I was tired. I'd only run ten miles in training and could feel every step beyond that. I wasn't having fun anymore and I just wanted to be finished. I didn't take any walking breaks and managed to run the rest of the way, but it wasn't pretty. The last quarter mile of the race was a straight shot down Chancellor's Walk, UNCW's main drag. This was really nice because I could see the finish line in the distance, which was super motivating. I finally dug in and ran as fast as I could, passing a number of people along the way. Since I hadn't done much passing during the rest of the race, I relished those last few minutes. And then it was over! We hung out at the finish line with our friends for a bit, had a beer at the after party even though it was only 9:30AM, and then hobbled back to our car, where we realized we had BROUGHT THE WRONG KEY. My car was at UNCW and Nathan's was at the beach, and we had Nathan's key with us instead of mine. We also had no phones, no money, no house keys, and we'd already parted ways with our friends - they were long gone. So we did the only thing we could do. We found some runners who were driving back to the beach to get their car (they'd done the same thing we had, but with the right keys) and begged a ride. They only had room for one, so I got to spend an hour in car with strangers new friends, while Nathan drank another beer and waited for my return. All in a day's work, I guess. My final time was 2:04:15, with an average pace of 9:30. Next year's race will take place on St. Patrick's Day, and I'm already telling everyone how hard I'll train, how fast I'll run, and how I'll beat my PR into the ground. Honestly though, as long as we remember to bring the right key, I'll feel like a winner.